College can be tiring. College can be stressful. A lot of the time, it’s both. So what can one do when the going gets tough? My answer to this question, as it has been for the longest time, includes a favorite mug, a tea bag or coffee, and a moment of bliss. This would be fully impossible without the indispensable college item that is an electric kettle! I still recall waking up every morning and making myself a cup of my favorite black tea. No morning was complete without it. To be able to establish a routine like that did give me a sense of comfort; no matter how hectic the day ahead was bound to be, thanks to my trusty kettle, I would at least be able to enjoy a cup of tea. Chugging Red Bull may work for others, but for me, a sachet of Nescafe espresso and my kettle was the best remedy for sleepiness and a need to study. 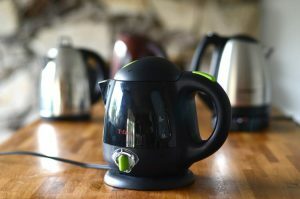 Electric kettles are inexpensive, don’t take up too much space, are allowed by housing, and easy to store no matter how small your dorm room may seem. But the most important thing about them, I’d say, is that they’re really cost effective. Spending money at Starbucks or a local cafe is downright expensive; coffee from the dining halls, although cheap, really does add up. This is a wise option for those of us who do really need our caffeine. The stresses of college would melt away with a cup of green tea. If there’s one item I highly recommend for your future dorm, it’s a kettle.